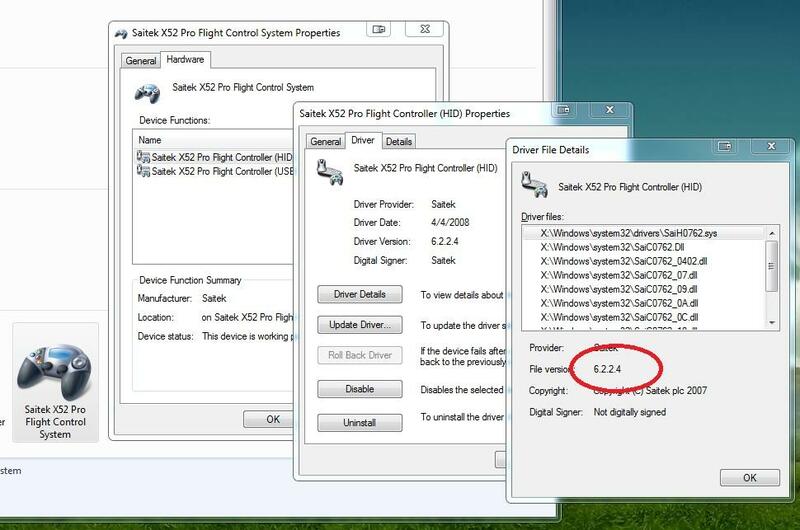 My problem is that I tried to use the latest Saitek driver(Saitek_X52Pro_Flight_Controller_7_0_27_13_x64_Drivers.exe) but that installation simply freezes after a while and #%&*$# the system so hard that I have to use a rest point or else I can't get the system up again. I also tried the old drivers(Saitek_X52Pro_Flight_Controller_SD6_64.exe) but here it is the same with the exception that this driver seems to install a bit differently and gets the first part over without problem, than it seem to install something about directoutput and that is where it hangs after a while. -Press and hold the Windows key on your keyboard and then press the letter R. This will open the Run box. Type regedit and then click ok. The Registry Editor will have a list of folders on the left hand side. Go down into the following folders in order by clicking the + next to the folder name. Delete any folder inside the Direct Input folder that begins VID_06A3. 7. Install the latest drivers and DO NOT PLUG IN YOUR X52 until the install program ASKS you to or you will have to redo this whole process. I simply can't erase it and I get the feeling the this exe is the problem of the freezing installations. Please guys I'm gong nuts, didn't have such silly driver problems since WindowsXP! Any help cleaning my system of Saitek is very appreciated! Last edited by BigDuke66; 06/27/13 08:10 PM. I don't have your board but see if you've got a bios setting for legacy usb. If so, I'd advise that you enable it. I've got a new board too and my x52 was having problems before I enabled that setting. Saitek is pretty bad with customer support....actually I don't think it exists at all. I am a long time user of the X-36, and now that my beloved X-36 has finally given up the ghost, I picked up an X-65. I had a lot of problems software-wise with my new stick, and ended up finding the HIDDEN Saitek FTP driver site during an extended odyssey of pre-2010 forum posts of Saitek software issues. Well, I say "hidden", but it is really just unadvertised, not linked to, and not mentioned at all anywhere on the Saitek website. You might try taking a look there to see if they have a newer driver, or maybe a later version of your programming software. Hope it helps, and PLEASE spread it around if you get the chance. If you are still trying to clear all the stuff left behind after uninstalling the Saitek drivers try this utility from Logitech called ClrCalib ( Clear Calibration Utility ). Go to this link and scroll down to the Clear Calibration Utility --- read the readme and hopefully you should be good to go--it is a very simple tool that works great. Install new drivers and plug in x52 when told. I have done this about 5 times today. None of it helped. When I would download a profile, my x52 Pro MFD would not display the profile name. When I pressed a button it would not display the programmed button's name. While looking at my X52 Device Drivers I noticed that most of them said they were version 7.0.27.13!!! How can that be if I just installed my old 6.2.2.4 and 6.6.6.9 drivers and software??? Then I noticed on the .exe Properties Description it said "Saitek SST (SD6)64bit Software webinstall". Web Install??? I've had this file for about 4 years! So, I guessed it might be using the internet and downloading 'other' versions of drivers instead of installing the versions it said. So I unplugged my network cable and redid the steps above once again... That fixed it. My MFD suddenly started working fine. I plugged my network cable back in, and checked the Driver versions. Now some of them say 6.2.2.4 or they just say Unknown instead of the newer version 7.0.27.13! Not sure why this dropped of my radar, anyhow what really helped was to plug the Saitek stuff into an USB2 port NOT USB3. With USB2 everything runs fine. Be sure you have also deleted any MadCatz folder in the temp file and used uninstall programs to delete anything Saitek and empty your recycle bin.